This article is part of the Commander's Guide series. Continuing the tradition of bonus releases this weekend, it's the Y-Wing, the Rebel's equivalent to a TIE Bomber. The Rebel's Y-Wing is similar to the Imperial TIE Bomber in many ways. Both are relatively inexpensive, with the Y-Wing's cost of 10 fairly close to the TIE Bomber's 9. Both are BOMBERs and HEAVY, and both attack enemy ships with an Anti-Ship armament of 1 Black die. But what does that 1 extra point get you over the TIE Bomber? Well, the Y-Wing drops in speed compared to its Imperial analog, going from Speed 4 down to Speed 3, putting it at the same pace as the Rebel X-Wings. 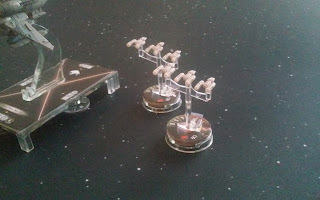 However, the Y-Wing does trade out the 1 Black Anti-Squadron armament for 2 Blue, and increases its hull to the largest squadron hull currently in the game, at 6. 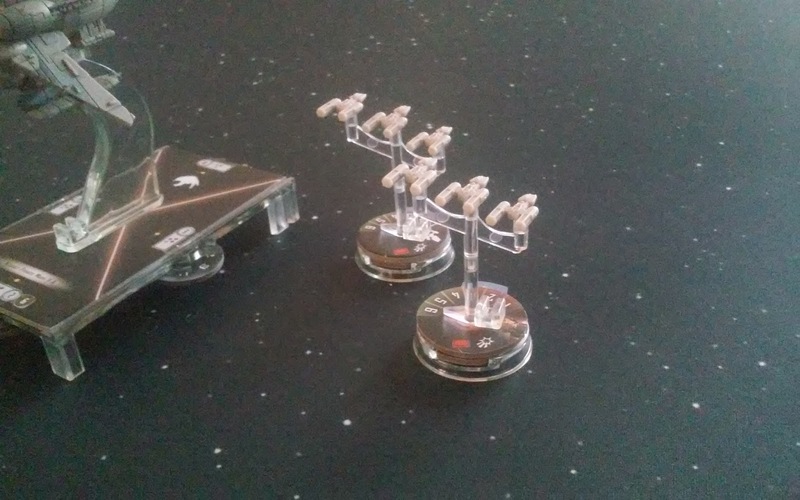 The Y-Wing's role is much the same as the role of the stock TIE Bomber - it is an inexpensive Black die to throw at an enemy ship that hasn't brought any fighter coverage, via Squadron command. It has very limited anti-squadron capabilities - an average of 3 Y-Wing activations are needed to take out a single TIE Fighter. So as before, you will need enough squadrons on hand to engage the other enemy squadrons in order to use the Y-Wings to their fullest potential. The Y-Wing is a BOMBER and its role is to attack enemy ships. Well, "Dutch" decided somehow that the unique Y-Wing pilot should be all about Anti-Squadron utility - and he fills an excellent role in this. For 16 points, Dutch adds an extra Blue Anti-Squadron die to the stock Y-Wing, bringing his total to 3 Blue. In addition, he gains the ability to lock down enemy squadrons that he damages in combat. If he attacks an enemy squadron that has not yet activated, he can toggle its activation slider, locking it out of taking any actions for the round. If the enemy is already activated, he instead deals an extra point of damage. Note, that this is after a squadrons suffers damage, so they won't be able to Brace or Gallant Haven away the extra point of damage. Obviously, this makes "Dutch" an excellent way to lock down a specific elite enemy, such as Darth Vader, Wedge or Tycho. "Dutch" also has a lot of synergy with a Wedge of your own, letting you activate an enemy for Wedge to throw his 6 Blue dice against. "Dutch" also comes with 2 Brace tokens, to really make his 6 hull last against enemy Anti-Squadron fire. Next time we will be covering the TIE Interceptors! Keep your eyes open. And don't forget to sign up for the mailing list so that you can know as soon as the newest article is released!